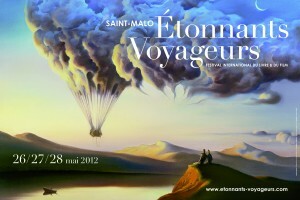 This weekend the Saint Malo, Brittany-based international literary and film festival, Etonnants Voyageurs, or Astonishing Travelers opens, and as usual, promises to be quite astonishing. Originally founded by French writer Michel Le Bris in 1990 to celebrate travel writing, the festival has since become the country’s leading world literature event. In 2007 Le Bris and other writers, including JMG Le Clézio, Edouard Glissant and Tahar Ben Jelloun, published a manifesto entitled “For a World Literature in French” and are in large part responsible for broadening the scope of French-language literature to include “Francophone writers” such as Alain Mabanckou, Maryse Condé, and Dany Laferrière. This year, festival organizers are particularly proud: Etonnants Voyageurs has joined the World Alliance, a partnership of literary festivals that includes Edinburgh, Jaipur, Berlin, Beijing, Melbourne and PEN World Voices. Writers from Etonnants Voyageurs will consequently be invited to World Alliance partner festivals, paving the road to translations and foreign rights sales for their books. A representative from each of these festivals will be present in Saint Malo along with publishers, booksellers, filmmakers, musicians, artists and over 200 authors. This year’s festival will ambitiously focus on five rather scattered themes, given the “disturbing and fascinating world that is emerging” said Le Bris. Last but not least the Arab Spring is inevitably a topic with the added element of this year being Algeria’s 50th anniversary of its independence. Three noted philosophers, Souad Ayada, Christian Jambet and Daryush Shayegan have been invited to reflect on Islam, while writers such as Egyptian Alaa El Aswany, Algerian feminist Wassyla Tamzali and Syrian poet Maram al Masri will be present as well. The film festival brings together an impressive selection of documentaries and features ranging from Franco-Cambodian filmmaker Rithy Panh’s documentary on Khmer Rouge torture master Duch (Panh’s memoir L’Elimination was published by Grasset last year) to the docu-drama on Allen Ginsberg, Howl, by Rob Epstein and Jeffrey Friedman or Ali Samadi Ahadi’s Tehran Spring. As this cosmopolitan crowd gets ready to converge on the walled city of Saint Malo, Michel Le Bris’ comment “the only specialists I know in the area of the unknown are artists” somehow rings true.